The Maccabi Tel Aviv FC Foundation officially participates in this year’s #Morethanfootball Action Weeks by organising a special event with Chinuch L’Psagot. Over 150 children enjoyed a special event at Kiryat Shalom as the participants met the players, took part in a football tournament, enjoyed a Pizza Prego lunch and more. 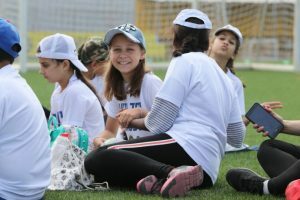 The Maccabi Tel Aviv FC Foundation held a special event with Chinuch L’Psagot* (English: Educating for Excellence) at the Kiryat Shalom Training Facility. 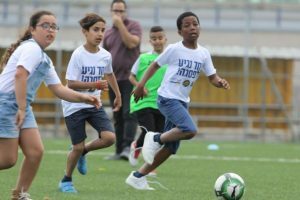 Over 150 children between the ages of 7-12 from the three centers (Kiryat Shalom, Ramle, Netanya) that the Foundation holds weekly football training sessions at, took part in the activities that stressed education and values in sportsmanship, courage and determination. The activity began with the children meeting some of the club’s players, Eli Dasa, Eitan Tibi, Ofir Davidzada and Dor Peretz. A football tournament and kite making workshop followed and afterwards the participants had the opportunity to see the stars in action as Maccabi Tel Aviv played Maccabi Petah Tikva in a friendly. The event culminated with lunch provided by Pizza Prego. 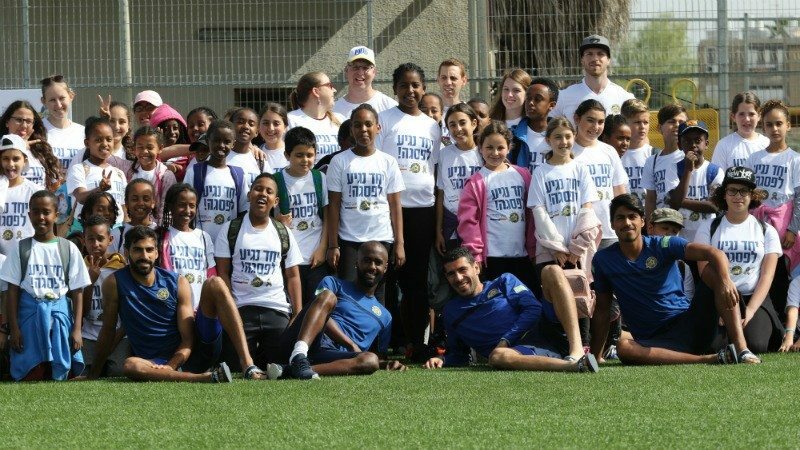 The football tournament was the highlight of the school year which featured Maccabi Tel Aviv FC Foundation weekly football training sessions based on values and education as the children were able to show their skills on the synthetic pitch at Kiryat Shalom. Chinuch L’Psagot strives to strengthen the Israeli society by reducing social gaps and creating equal opportunities for children with potential for excellence who live in the country’s social and geographic periphery. The organization has 41 branches around the country. The programmes with Chinuch L’Psagot are part of the #morethanfootball campaign, an initiative of the European Football for Development Network (EFDN) in partnership with ECA and the UEFA Foundation for Children. The main goal of the #Morethanfootball Action Weeks is to promote and celebrate the social impact of European professional football on society, by highlighting the CSR activities of clubs and other stakeholders in the game. *Chinuch L’psagot (or Educating for Excellence) was established in 1999 in order to provide equal educational opportunities for all children, while narrowing gaps within Israeli society. Founders of the program realized that motivated and talented children from economically distressed neighborhoods rarely receive support and encouragement, and often fail to complete their education. These are the very students that Chinuch L’psagot seeks to enroll, as early as 3rd grade, and whom remain with the program until they graduate from high school.